If you didn’t know it before, let me tell you now, I am a loyal customer and fan of The Honest Kitchen. I started feeding THK to my dogs approximately 3 years ago, so can you imagine my joy when I heard they were coming out with a bar shampoo for dogs? 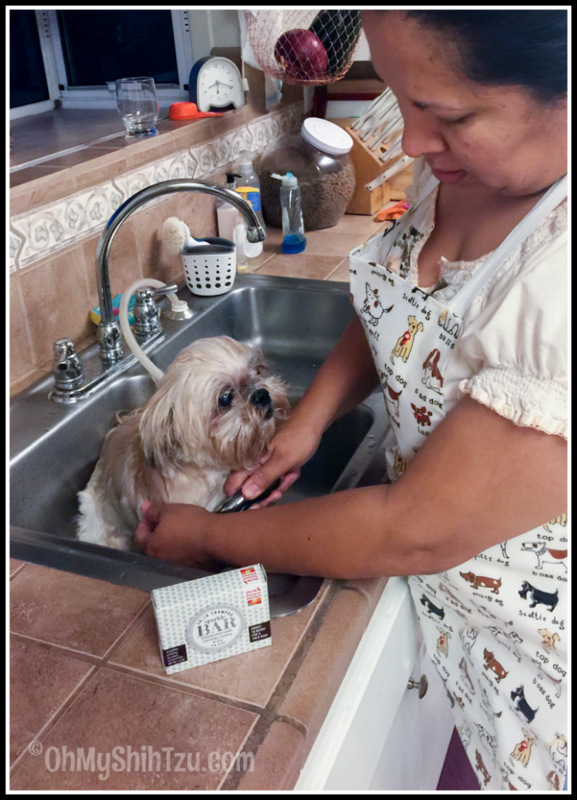 I’m always in search of that perfect Shih Tzu shampoo, especially for Katie and Ise who suffer from skin allergies. Yes, I do my best in feeding a natural healthy diet with organic supplements to help control the itchiness, but sometimes that just doesn’t work. 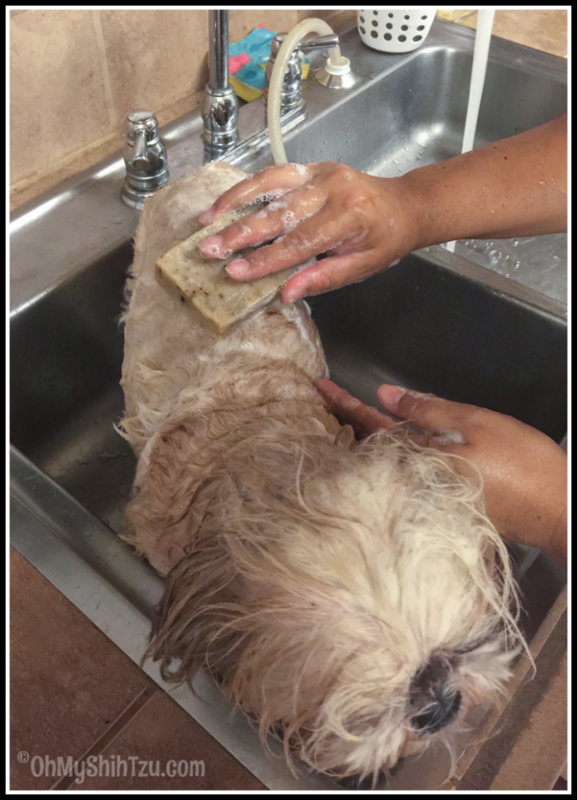 So when I found out THK was introducing their own line of shampoo called Sparkle Pet Shampoo Bars , I was ecstatic! They’re hand-made from free range goat’s milk blended with olive and coconut oil plus herbs and botanicals! But that’s not all, they are also environmentally responsible. You can say that these bars are sort of “dehydrated” compared to other regular shampoos that you are used to. Because there is no wasteful water in these bars, there is less packaging, and have a small carbon footprint when it comes to shipping! I love the fact there are 3 different “recipes” for dogs with different needs, and one, the Apple Cider Vinegar can be used on both Dogs & Cats! Diatomaceous Earth, Calendula, Comfrey & Aloe (for dogs) A special recipe for pups with skin irritation, hot spots and itching. This calming combination of silica-rich diatomaceous earth, healing Calendula and anti-fungal comfrey really helps to soothe and settle troubled skin. 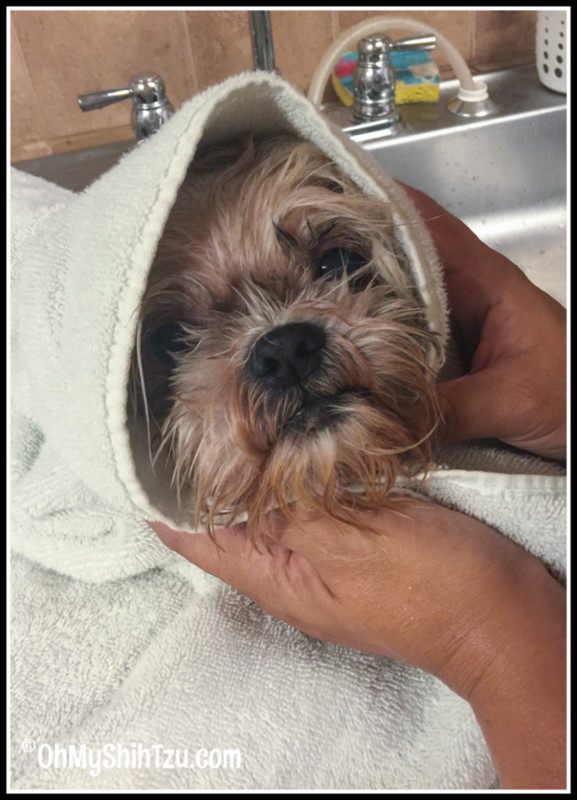 Apple Cider Vinegar (for dogs and cats) A simple formula for sensitive skin. Apple cider vinegar is the perfect choice for both cats and dogs who tend to react to highly fragranced shampoos or harsher products. Lavender, Cedar, Juniper & Rosemary (for dogs) An aromatic shampoo bar with a wonderful whiff that stays with your dogs fur/hair . The test of this was in shampooing Katie. Katie is almost constantly scratching at herself so I decided to use the Diatomaceous Earth, Calendula, Comfrey & Aloe. I loved the smell of the bar, how it suds up (not too much) and how easily it rinsed from her hair. Normally I rinse my girls with apple cider vinegar and apply a conditioner to their hair but this time I didn’t. Within the first 24 – 48 hours I witnessed a noticeable difference in the amount of scratching she normally does. I would say her scratching dropped off 85-90% of how often she normally scratches. Now you may be thinking, well that is just one dog, but we also used the Sparkle Bar on Ise too with the same results! I have found a great shampoo for the girls!! 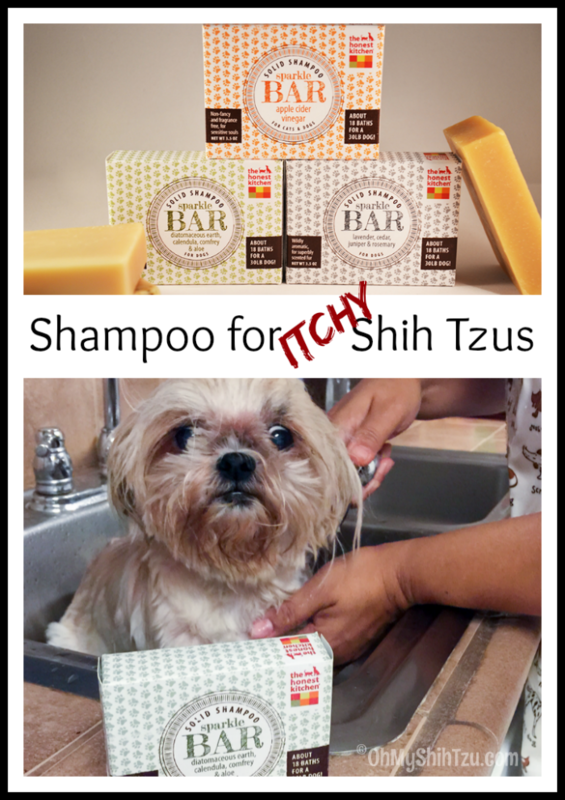 Yes the perfect Shampoo for Shih Tzus with itchy skin!!! So guess what? 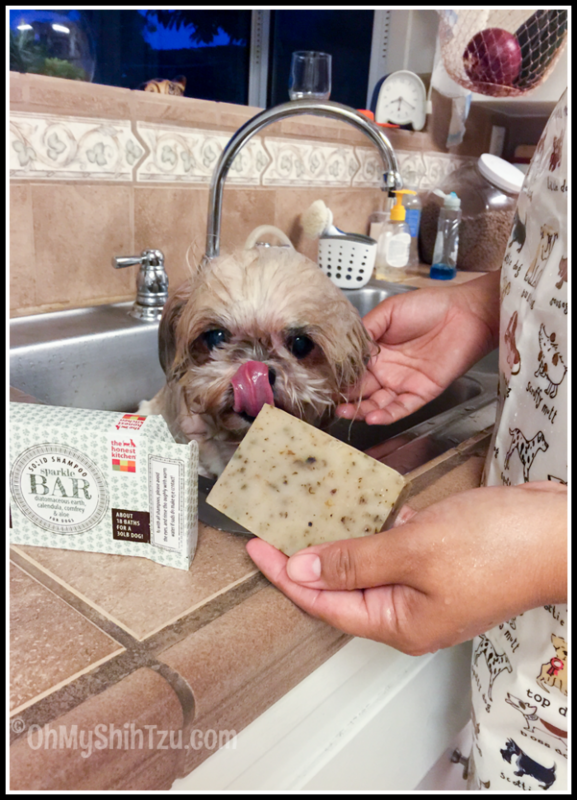 Since I thought this was the next best thing since sliced bread the wonderful folks at The Honest Kitchen wanted to give the readers of Oh My Shih Tzu a chance to try out the Sparkle Bars too! But you wont get to try only one, one lucky winner will get the opportunity to try all three Sparkle Bars! These sound awesome! Most soaps make my doggy really itchy. I’d love her to smell like lavender and cedar! I would love to try all three, but the apple cider bar will be especially helpful! Our dogs have long hair and like to roll around in the dirt a lot, I think this particular bar will help get all the dirt out! I would love to try the Diatomaceous Earth bar. My dog has sensitive skin that is itchy and I think it would help calm her skin. I’d love to try the Diatomaceous Earth, Calendula, Comfrey & Aloe Sparkle Bar the most. One of my dogs has allergies to grass and pollen and gets hot spots. I think this would be helpful! Totally lub dat U got all dat goodness in an easy to use bar – Sparkle bar is for us, it’s on our ‘must try’ list! The DE and Aloe one. Mr. N has a flea allergy and it drives us all crazy! Luna can have itchy skin occasionally so I think the Sparkle Bar with Diatomaceous Earth, Calendula, Comfrey & Aloe would be great to try! I love that THK is branching out to other products! Wow!!! I have been looking for a shampoo that might help Arty’s itchies and this one may just do the trick!! Dory’s Backyard recently posted…Smiley Happy Birthday to Sugar! I have not seen these yet! I’d probably also use the bar that you used for Katie on my dog. Sounds like it would help her… she’s also an itchy dog. We loved the Sparkle Bar that we tried, and I was really interested to read how they worked for you with a long-haired dog. It sounds like are as much of a fan as I am! I can’t wait to try the other varieties. This would be great for my mom’s dog Maui! It contains apple cider vinegar, huh? Heard GREAT things about the stuff. A good pal recommends using it on cats so I would imagine it’s a good ingredient to be included in a shampoo. will have to try this because the itchies are NOT fun and one of us is very allergic to grass. This sure looks luxurious! Enjoy! We are not bath fans and thankfully don’t have any skin issues, but this does sound interesting and easy to use.